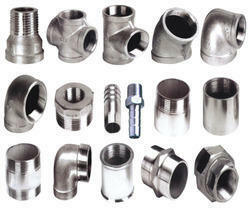 We are a leading Manufacturer of ss pipe fittings from Mumbai, India. We offer vast range of Stainless Steel Pipe Fittings, which is widely used in plumbing and fire prevention etc. We use all modern techniques, which are eco friendly in nature. We proffer corrosion free Pipe Fittings, which has proclaimed worldwide recognition. In addition to this, we also offer economical prices of our products.